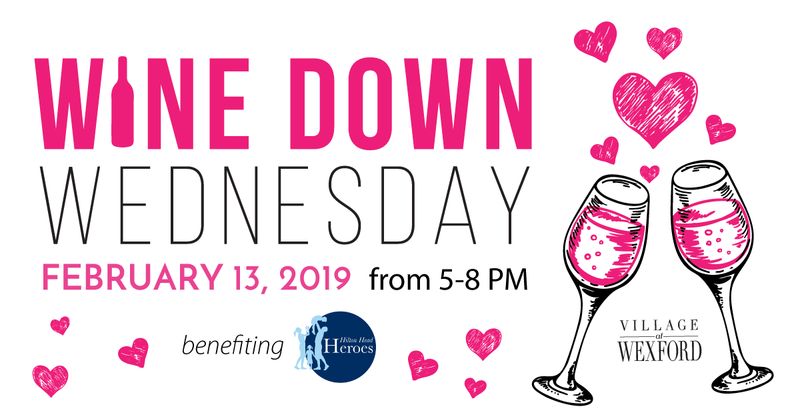 Join the Village at Wexford on Wednesday, February 13th from 5-8pm for a romantic one-of-a-kind wine tasting experience with live music on the patio! Follow the “tasting map” around the Village at Wexford to enjoy a variety of wine selections and tastings from participating merchants. Enjoy refreshments, special promotions, sales and in-store demos at participating merchants. Collect all pours and be entered to win a variety of prizes from Village at Wexford! Limited tickets available, $10/person*, which includes a souvenir glass and wine tastings at all participating merchants; proceeds to benefit Hilton Head Heroes, a 501(c)(3) organization bringing families with children suffering from life threatening illness to Hilton Head Island for cost free vacations. Only 50 tickets will be sold at the door and will be sold at $15/person – buy yours online today and save! *A photo ID is required to participate in the Wine Tasting.